Chief of Naval Operations Adm. John Richardson has detailed a strategy for the U.S. Navy to procure its next surface combatant ship that will build on the service branch’s ongoing FFG(X) frigate program, Defense News reported Thursday. 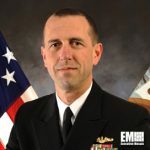 “I’d like to do the whole thing, well, as fast as possible but do it in the frigate timeframes: in terms of defining what we want, the requirements, getting industry involved, making it a very open competition,” Richardson was quoted as saying. He told Defense News in an interview the Navy’s cruiser replacement effort would adopt an existing hull platform with high-power and rapid switching capacities. The CNO added he aims to define requirements for the upcoming combatant ship within the 2018-2019 time frame, according to the report.